The heart of winter activities in Breckenridge is skiing and snowboarding at Breckenridge Ski Resort and is the major draw for tourism to the area. 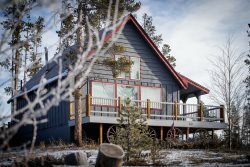 The town of Breckenridge stands at 9,600’ and the resort is accessed by the BreckConnect Gondola that runs from the center of town up to the base of Peak 8. The resort is a combination of 5 peaks (Peaks 6 through 10) that make up the southern half of the Tenmile Range, all featuring a variety of terrain for skiers and riders to enjoy. The highest chairlift at Breckenridge is the Imperial Express Superchair that begins at 11,901’ and ends at 12,840’ Atop Peak 8! Skiers can hike above the top terminal of the Imperial lift to just under 13,000’ and ski down as well as take in some breathtaking views! Peak 6 - Peak 6, to the north of Peak 7, is also geared primarily to intermediate skiers and riders, but also includes a large amount of advanced terrain and chutes. Peak 7 - Peak 7 is known for its bowls which are accessible by hiking from the T-Bar or a traverse from the top of the Imperial Express SuperChair. The lower part of Peak 7 is an area of rolling intermediate trails, groomed nightly. Peak 7's base area is composed of two large lodges, the Crystal Peak Lodge and the Grand Lodge on Peak 7, and is connected to town by one of two midway stations on the BreckConnect Gondola. The base area also has a restaurant, Sevens, opened in February 2009. Peak 7's terrain is serviced by the Independence SuperChair. Peak 8 - The Peak 8 Base Area is the main starting point for most visitors. Peak 10 is the southernmost peak on Breckenridge mountain, which comprises mostly of black and double black trails (expert terrain) that is accessible from the Falcon SuperChair. The terrain varies from groomers underneath the chairs to glades on the north side of the Peak 10 ridge and chutes on the far south side. Weekend traffic from Denver can be very busy with delays up to 3-4 hours depending on weather conditions and travel times. It is highly recommended to leave plenty of extra travel time and avoid peak travel times such as heading westbound at 5:00 PM on Fridays and eastbound during Sunday afternoons. Crowds are much more minimal during weekdays, so try to plan your trip during the week! How much snow does Breckenridge get? How much are Breckenridge season passes and lift tickets? When are Breckenridge slopes open? When do they close? Handling the elevation in Breckenridge and avoiding altitude sickness. How far is Breckenridge from Denver - Breckenridge is 80 miles from Denver and can be reached via I-70 West to CO-9 South.